The transition area will be in the parking lot next to Bond Brothers. You will start at the tables then run toward the Time Line then quick u turn then out of the transition area taking a right on E Cedar Street then u turn back to the transition area to the tables then drink a beer. Complete this 4 times and on the final lap go straight to the finish line. The course will follow a counterclockwise flow with all participants going an equal distance for each lap. More directions will be given the event day! 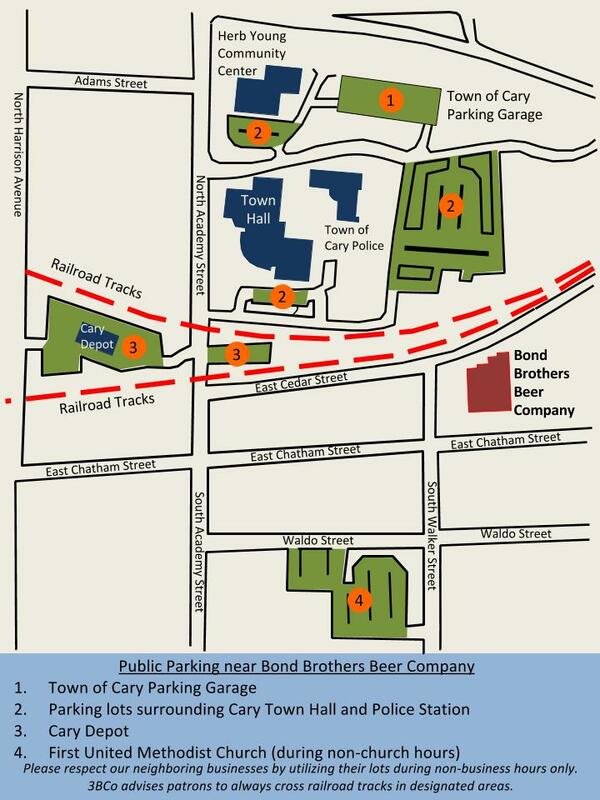 Parking Map - There will be no parking on E Cedar Street between Bond Brothers and Cary Plumbing. Running is more fun with beer. We can't think of anything that goes together as well as running and beer, so we've teamed up to produce 2nd Annual Beer Mile. No longer do you have to sneak into the track at night with a few buddies, hoping not to get caught, chugging cheap beer and keeping time with your swatch watch. We're moving to Bond Brewing in Downtown Cary for this special event and serving up some beer. Drink, Run, Repeat. It is simple: drink 1 12oz cup of beer (we'll be serving???? ), run 0.25 miles and repeat 4 times. The fastest Beer Mile runner wins bragging rights for an entire year. Costumes are highly encouraged. Check out our crew racing the FS Beer Mile 2014 in the video below to see just how much fun the beer mile really is! Our event will be fully chip-timed, at Bond Brothers Brewing. We'll have live music, food and drinks What else better do you have to do on a Thursday night? But I'm Not A Runner! We've got you covered. Sign up for our Instant Gratification Run and you'll be across the finish line before you know it and ready to enjoy your post-race beers! 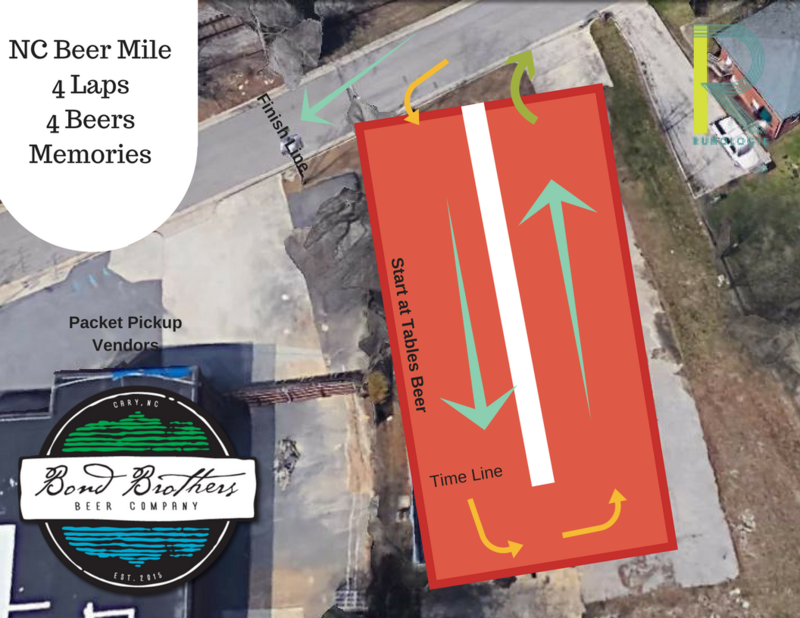 How it works: You'll start and finish using the same start and finish lines as the Beer Mile runners, without all that running nonesense in the middle! You'll be "running" 0.00 miles, as you'll go immediately through the finish arch. We will have a random drawing for overall male and female winners and a free beer, t-shirt and bib number with your entry! This event is perfect for those wanting to support friends racing or who just like a good post-race party. All the party, none of the work! You must be 21 years of age or older to participate in both the Beer Mile and the Instant Gratification Run. Expect to have identification available at registration. We will not refund entrants who are under the age of 21 that show up to race. We also require that you identify a designated driver for your ride home. Let's all stay safe out there! Ready to start training? We gave the Beer Mile a test drive in 2014 and by all measures it passed our test! Check out the guys in action. Thanks to Twin Lens Films for the video. 2014 Beer Mile from Twin Lens Films on Vimeo. The Beer Mile Party ends! For any questions or additional information, please contact us via email at jason@fsseries.com.